Nigerian Professional Football League side Heartland of Owerri are on the brink of officially announcing the capture of striker Peter Maduabuchi Okereke ahead of the new season. 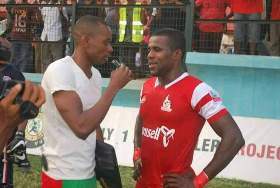 The former Rangers International, Rivers United and FC Ifeanyi Ubah player is excited with the prospect of teaming up with the Owerri side. The Anambra State born striker appended his signature to a 2+1 year deal with the Naze Millionaires. Speaking with allnigeriasoccer.com, the player's intermediary Endurance Iseri Ogbemudia confirmed the move which he said was facilitated by his scouting partner Mr Chukwuma Udofia, and commended Heartland FC for securing the services of the fast rising star who also has offers from abroad . With persisting offers, the player may make a switch to a foreign club anytime sooner than expected.